A couple of pieces of Mike Pence news, to which I want to direct your attention. 1. Tony Cook at the Indy Star: [Content Note: Video may autoplay at link] After Six Months, Pence Has Now Turned over All State-Related AOL Emails, His Attorney Says. It took nearly six months after he left the governor's office, but Vice President Mike Pence and his legal team say they have now provided Indiana officials with all emails from his personal AOL account involving state business. Pence attorney Karoline Jackson said in a recent email to the state's legal counsel that "a complete electronic production of state records" from Pence's time as governor had been delivered to the state as of June 23. The office of Pence's successor, Gov. Eric Holcomb, said the records consist of state-related emails from two AOL accounts Pence used as governor. So, let me just stop right there to note the carefully and repeatedly inserted caveat about the emails being "state-related." That means they've excised anything they've deemed to be unrelated to state business. One might reasonably note Hillary Clinton didn't turn over personal emails, and that is correct. But note that there is a meaningful difference between "personal emails" and "emails unrelated to state business." It sounds like semantics, but it actually creates a whole lot of wiggle room for Pence to argue that he didn't believe a discussion about, hypothetically, quid pro quo was official state business. NB: "Pence's attorneys are only providing emails they consider to be related to state business, but [Pence spokesman Marc Lotter] did not answer questions about how those determinations are being made." Also worth noting: Despite Pence's repeated contention that he broke no laws, "Indiana's public access counselor recommends that public officials who use private accounts forward or copy state-related emails to their state accounts, so that they can be preserved and searched in response to public records requests. There is no indication Pence took such steps." Currently pending are "roughly 50 public record requests for Pence's emails. Some of those requests are more than a year old and about half were made while Pence was governor, but went unfulfilled. The pending requests seek Pence's emails on a variety of topics, including Donald Trump, Indiana's controversial Religious Freedom Restoration Act, voter fraud, Syrian refugee resettlement, lead contamination in East Chicago, and the HIV outbreak in Scott County." Pence has had six months to comb through his emails, knowing what those requests entail. And we have no idea how his legal team assessed whether emails on those subjects were considered (by them) to be "state-related." That's how Mike Pence does business. A complete lack of transparency, contempt for the law, and zero accountability. 2. Kenneth P. Vogel at the New York Times: Pence to Speak at Conservatives' Meeting Organized by Koch Brothers. In a sign of an expanding alliance between the Trump administration and one of the most well-financed forces in conservative politics, Vice President Mike Pence has agreed to speak to a gathering of the billionaire Koch brothers' advocacy network this month. Mr. Pence will deliver the keynote address on Aug. 19 in Richmond, Va., to the annual meeting of activists and donors organized by Americans for Prosperity, the group announced on Friday. The nonprofit advocacy group is financed by the industrialist brothers Charles G. and David H. Koch, and their allies. The Koch brothers steer a network of groups that spent between $720 million and $750 million to bolster conservative policy positions and politicians in the run-up to the 2016 election, according to people familiar with the spending. Yet the groups withheld support from [Donald] Trump's campaign out of distaste for his populist and protectionist rhetoric, which clashed sharply with the Kochs' support for free-market policies. But in recent weeks, the Kochs' groups — as well as other deep-pocketed conservative outfits — have expressed increasing support for Mr. Trump's plans to overhaul the tax code. I'm sure that, on some level, the Kochs' support for Trump's "tax reform" proposal is genuine, because the Kochs are dedicated fans of wealth redistribution upward schemes. But I also believe that support for the tax plan is a cover to explain their working with Pence, instead of openly admitting they're increasingly confident he'll soon be president. A promotion for which Pence has been quietly laying the groundwork just in case: His former longtime aide Marc Short is now the White House legislative affairs director; Short also "once worked for the Koch network." And Pence "met with Charles Koch for an hour in June," just to keep the hearth warm. He's making his moves. 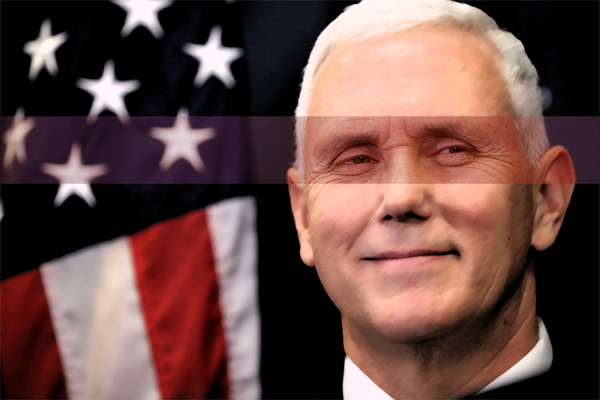 Keep your eyes on Pence.